2 2 Welcome This guide has been designed to help you organise the payment of your tuition fees, accommodation fees and any other fees that you may be required to pay to the University. 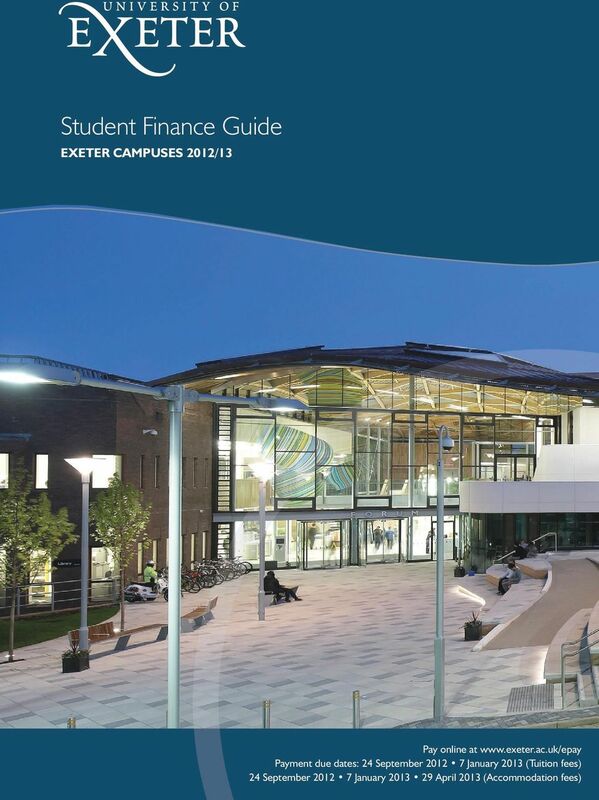 It also contains details of what we consider essential financial information which should prove beneficial during your time at the University of Exeter. 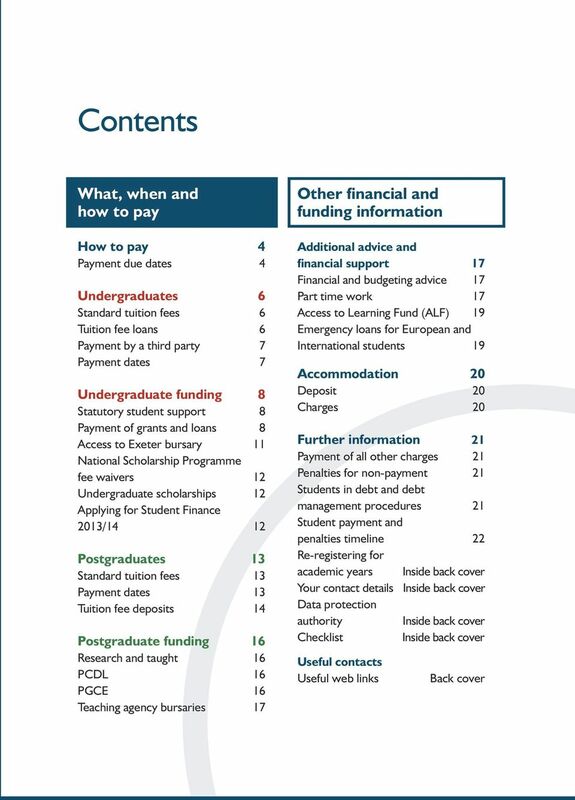 It is advisable that you read this guide carefully before contacting the University regarding your finances and we would also advise that you keep this guide with you for the whole academic year. If your parents/guardians are paying the fees on your behalf, it may be advisable to refer them to our website. 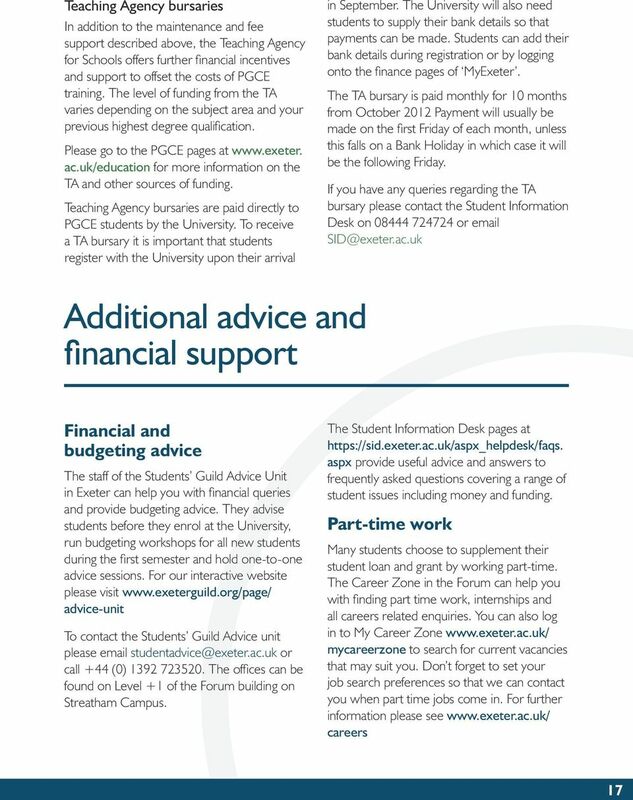 Further copies of this guide can be downloaded from Throughout the year you can pay your fees and check your balance with the University by accessing your MyExeter account at Simply click on the Student Record tab. The link to the online statement can then be found on the right hand side of the page. Student Information Desk Phone: For impartial advice you can also contact the Students Guild Advice Unit at or call +44 (0) We hope you enjoy your time here at Exeter! 5 5 Online Please note that all payments made directly to the University of Exeter by non UK debit cards and all credit cards either online through our telephone system or at the Student Information Desk are subject to a fee of up to 1.5% added to the payment Payments made online are confirmed via an automated ed message Credit or UK debit card Please note that all payments made directly to the University of Exeter by non UK debit cards and all credit cards either online through our telephone system or at the Student Information Desk are subject to a fee of up to 1.5% added to the payment Please note the University does not make any charge for paying by UK debit card. Please check with your bank to see if they will make any charges for paying with this method If you are using an overseas card, additional identity checks are normally made by your bank, payments could possibly be declined. If this happens, the transaction will be cancelled, and payment by another method will be required, within the University s normal payment deadlines. UK cheque or bank draft Acknowledgement receipts for cheque payments are only issued, on request, where there are exceptional circumstances. 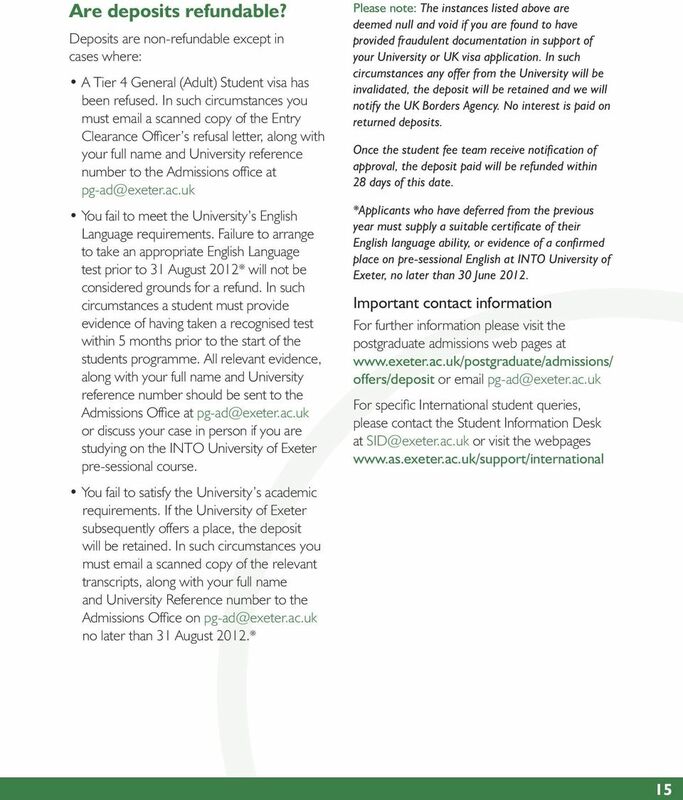 UK/EU and overseas bank transfers to the University of Exeter If you wish to pay from a UK or EU bank account by bank transfer please contact Please remember to state the originating country of your bank when contacting the University It is essential that your student ID number and student name are quoted when making your transfer and on all documentation Please ensure that when making the transfer you request to pay the charges of the sending and the receiving bank, to prevent a shortfall in your payment The University of Exeter use Western Union Business Solutions (WUBS) for all non-eu/ International bank transfers. For more information please use students/finance/howtopay International transfers take between 3 and 10 working days; please allow adequate time for the payment to be received by the due date to avoid late fees being charged. Cash If you pay by cash, please make sure you keep the receipt safe. We regret that we can only accept cash payments up to per student per term. 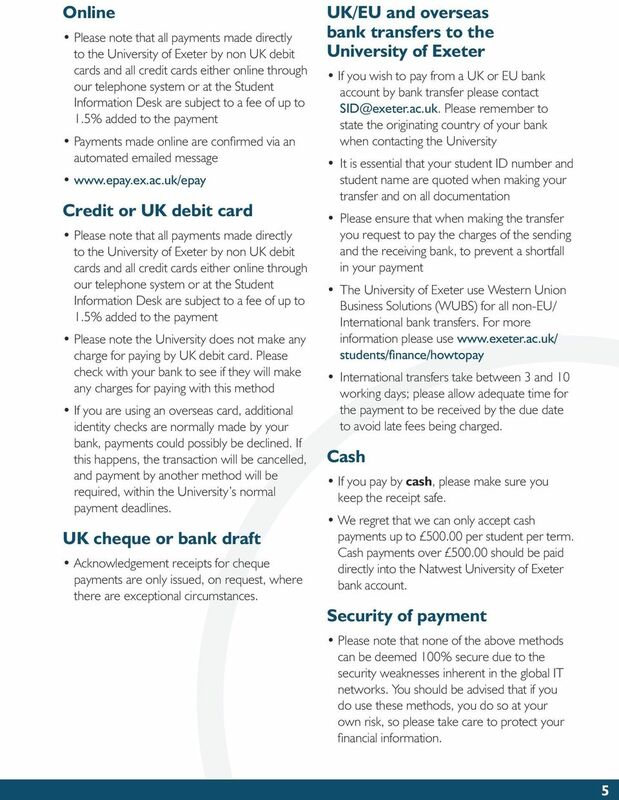 Cash payments over should be paid directly into the Natwest University of Exeter bank account. Security of payment Please note that none of the above methods can be deemed 100% secure due to the security weaknesses inherent in the global IT networks. You should be advised that if you do use these methods, you do so at your own risk, so please take care to protect your financial information. 7 7 Payment of tuition fees by a third party If you are not paying your fees with a tuition fee loan, you will be held personally liable for the FULL amount of fees unless you have informed the University that the fees are being funded by a recognised sponsoring organisation or company. However, if the sponsor fails to make payment by the due dates, responsibility will revert back to you. You will also be charged a late payment fee of 3% and further penalties as detailed in this guide may apply. Please note: You must provide the University with the necessary documentation relating to your sponsor, for example a Financial Guarantee. 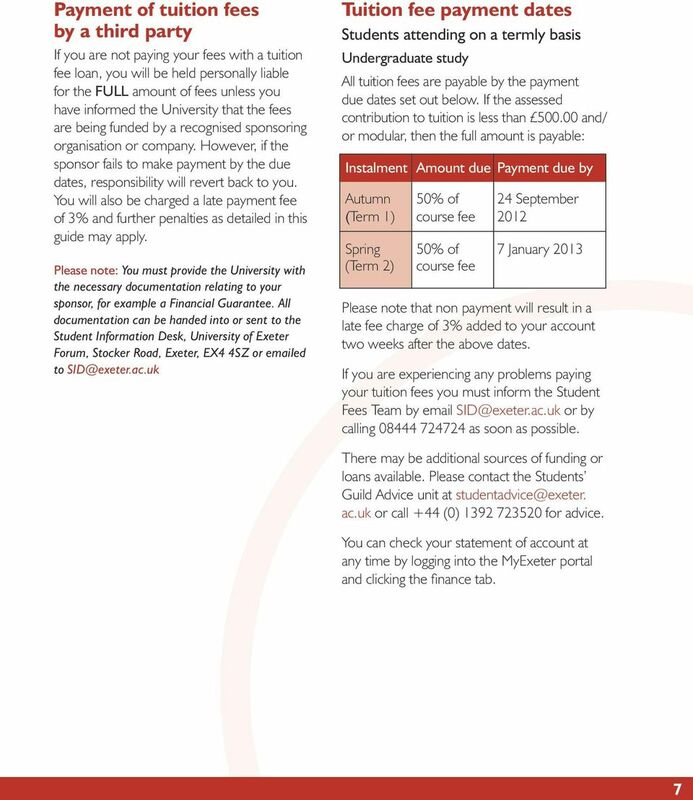 All documentation can be handed into or sent to the Student Information Desk, University of Exeter Forum, Stocker Road, Exeter, EX4 4SZ or ed to Tuition fee payment dates Students attending on a termly basis Undergraduate study All tuition fees are payable by the payment due dates set out below. If the assessed contribution to tuition is less than and/ or modular, then the full amount is payable: Instalment Amount due Payment due by Autumn 50% of 24 September (Term 1) course fee 2012 Spring 50% of 7 January 2013 (Term 2) course fee Please note that non payment will result in a late fee charge of 3% added to your account two weeks after the above dates. If you are experiencing any problems paying your tuition fees you must inform the Student Fees Team by or by calling as soon as possible. There may be additional sources of funding or loans available. Please contact the Students Guild Advice unit at ac.uk or call +44 (0) for advice. You can check your statement of account at any time by logging into the MyExeter portal and clicking the finance tab. 12 12 National Scholarship Programme (NSP) fee waivers This is a new scheme for 2012/13, and is only open to students starting their studies in September To be eligible you will need to meet the following criteria: You must be an Undergraduate student (Full time or Part time) You must be a UK student (EU students who started their course in 2012 are also eligible Your household income must be below the threshold from the scheme. In 2012 the threshold is 25,000. 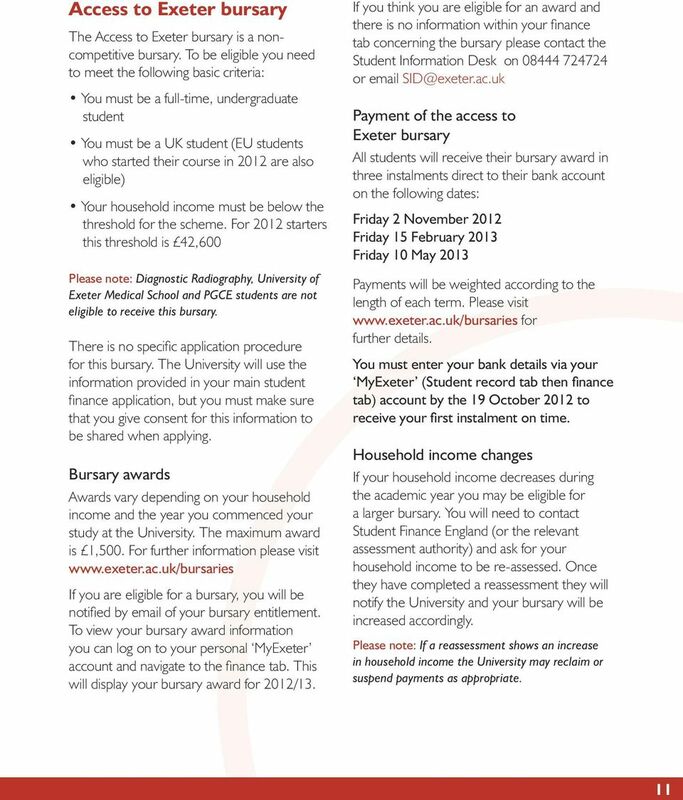 As with the Access to Exeter Bursary, we will use the household income information that you supply in your main student finance application to assess your eligibility for the scheme, so you must ensure that you have given consent for this information to be shared. Entitlement to the NSP Fee Waiver is assessed in the following way: Annual Household NSP Fee Waiver Income 16,000 or less 3,000 (students have the option of receiving 1,000 of this as an NSP Award, paid in three instalments) 16,001 to 20,000 2,000 20,001 to 25,000 1,000 All fee waivers will be deducted from tuition fees. 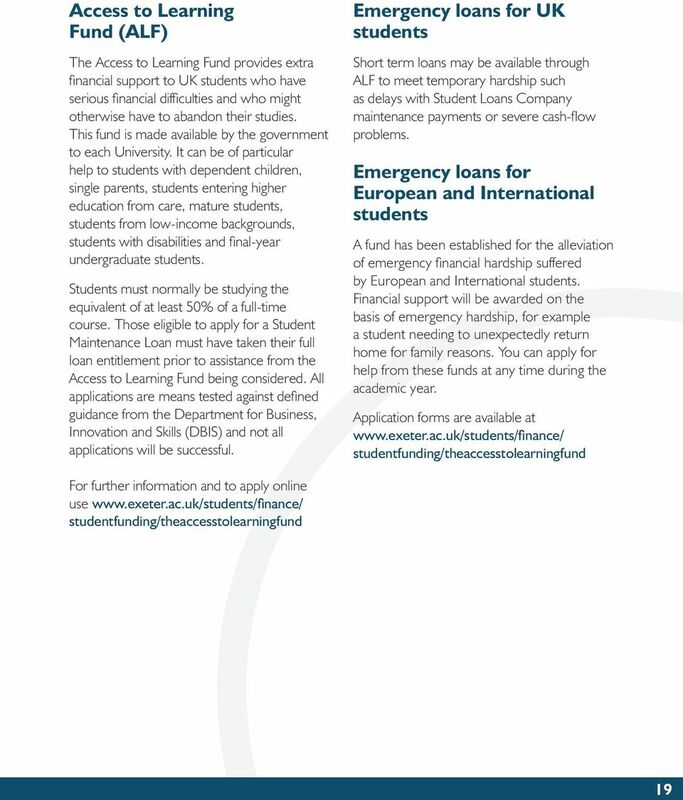 In cases where less Tuition Fee Loan is required as a result, the University will liaise with the Student Loans Company to ensure the correct amount of loan is paid. If you are eligible for an NSP Fee Waiver, you will be notified by of your entitlement. To view your NSP information you can log on to your personal MyExeter account and navigate to the finance tab. This will display your NSP Fee Waiver for 2012/13. 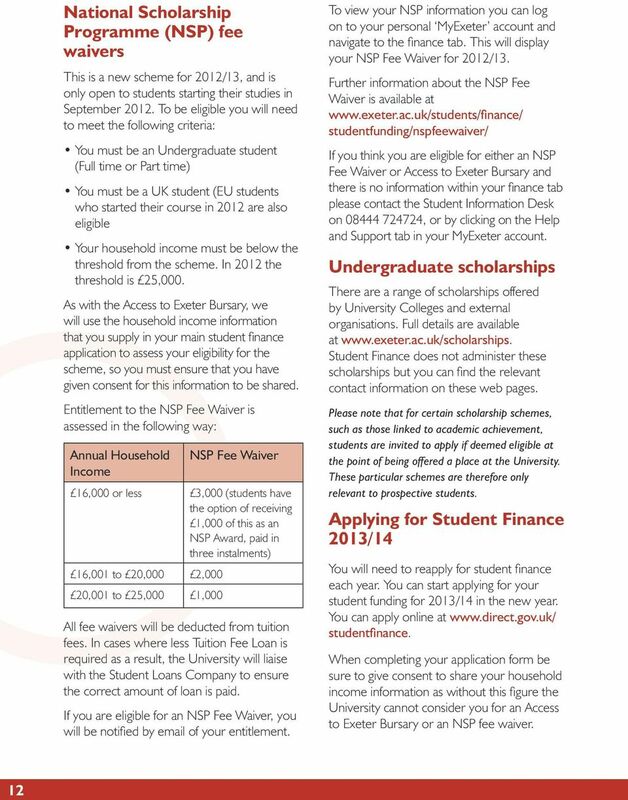 Further information about the NSP Fee Waiver is available at studentfunding/nspfeewaiver/ If you think you are eligible for either an NSP Fee Waiver or Access to Exeter Bursary and there is no information within your finance tab please contact the Student Information Desk on , or by clicking on the Help and Support tab in your MyExeter account. 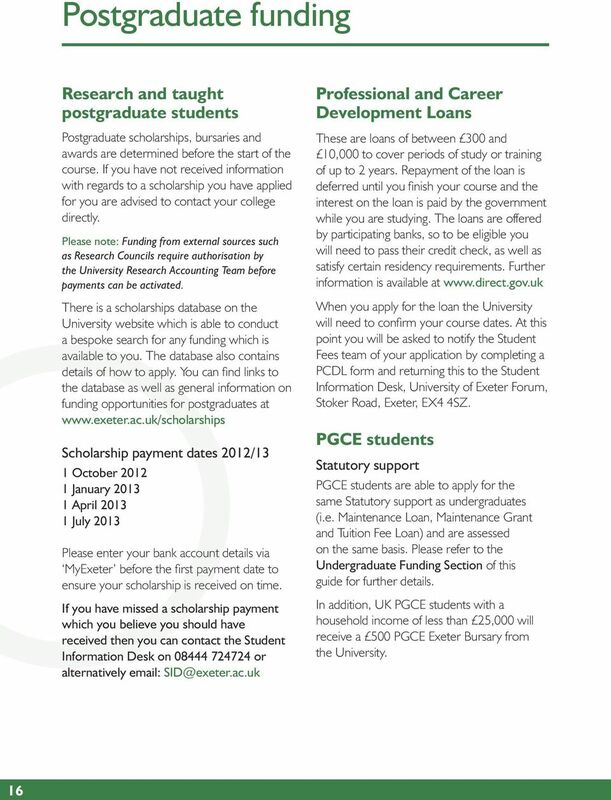 Undergraduate scholarships There are a range of scholarships offered by University Colleges and external organisations. Full details are available at Student Finance does not administer these scholarships but you can find the relevant contact information on these web pages. Please note that for certain scholarship schemes, such as those linked to academic achievement, students are invited to apply if deemed eligible at the point of being offered a place at the University. These particular schemes are therefore only relevant to prospective students. 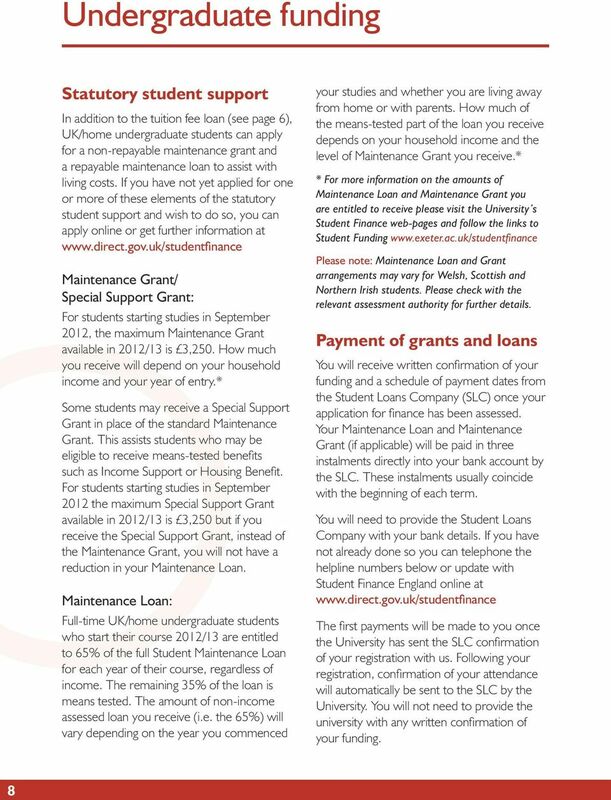 Applying for Student Finance 2013/14 You will need to reapply for student finance each year. 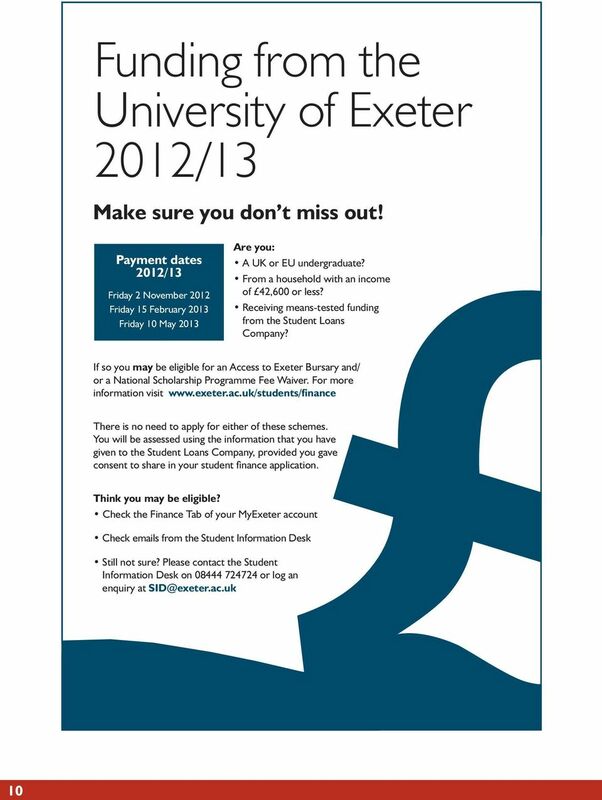 You can start applying for your student funding for 2013/14 in the new year. 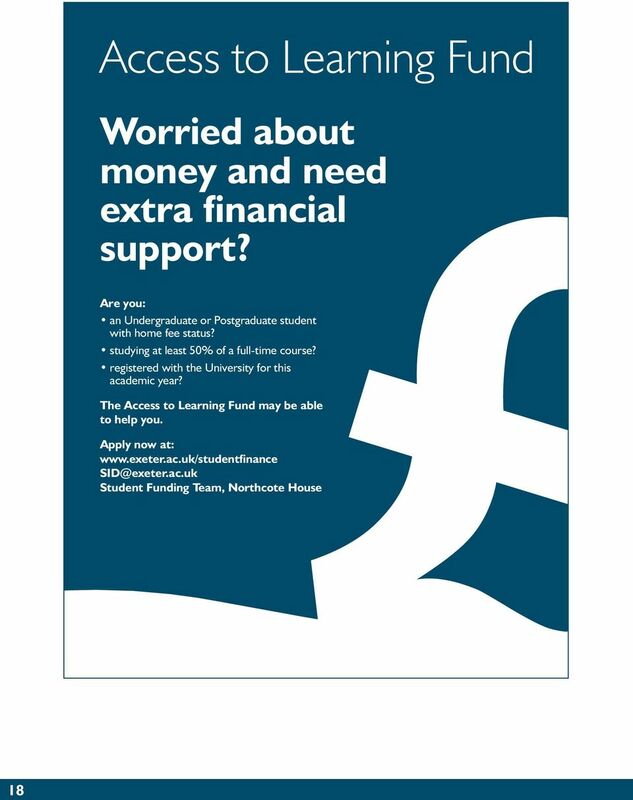 You can apply online at studentfinance. When completing your application form be sure to give consent to share your household income information as without this figure the University cannot consider you for an Access to Exeter Bursary or an NSP fee waiver. 13 13 Information for postgraduate students Tuition fees Standard tuition fees for 2012/13 UK and EU Postgraduate students Full-time Taught Masters 4,800 Part-time Pro rata (Credit based) Full-time MPhil/PhD Entry prior to 30 September ,650 Entry after 1 October ,850 Part-time Entry prior to 30 September ,825 Entry after 1 October ,925 PGCE 9,000 International Postgraduate students Full-time Taught Masters (Band 1) 12,600 Full-time Taught Masters (Band 2) 14,500 Part-time Pro rata (Credit based) Full-time MPhil/PhD (Band 1) 12,300 Full-time MPhil/PhD (Band 2) 14,100 Part-time (Band 1) 6,150 Part-time (Band 2) 7,050 PGCE 12,600 These fees apply to students registering in September Students registering outside of this period should contact the Student Information Desk on for clarification. 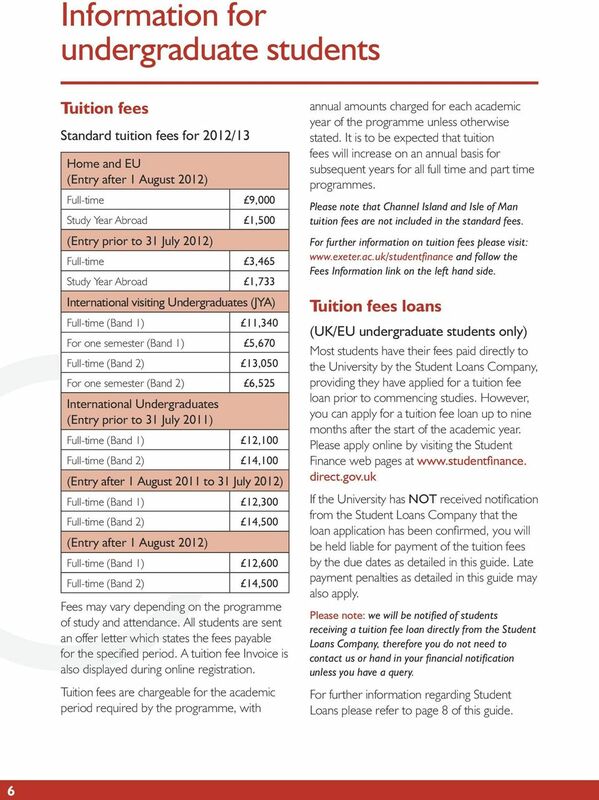 Fees may vary depending on the programme of study and attendance. 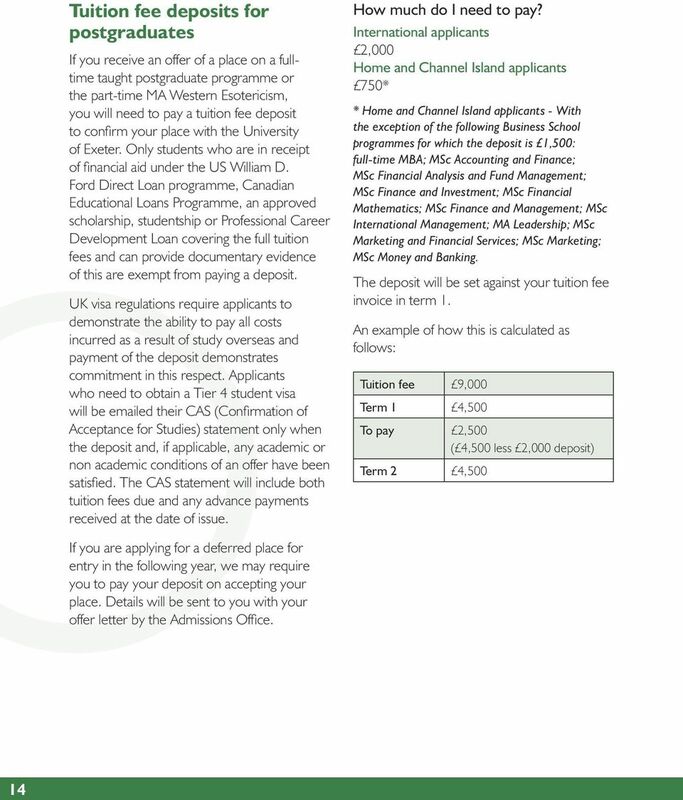 All students are sent an offer letter which states the fees payable for the specified period. A tuition fee Invoice is also displayed during online registration. Tuition fees are chargeable for the academic period required by the programme, with annual amounts charged for each academic year of the programme unless otherwise stated. It is to be expected that tuition fees will increase on an annual basis for subsequent years for all full time and part time programmes. For further information on tuition fees please visit: and follow the Fees Information link on the left hand side. 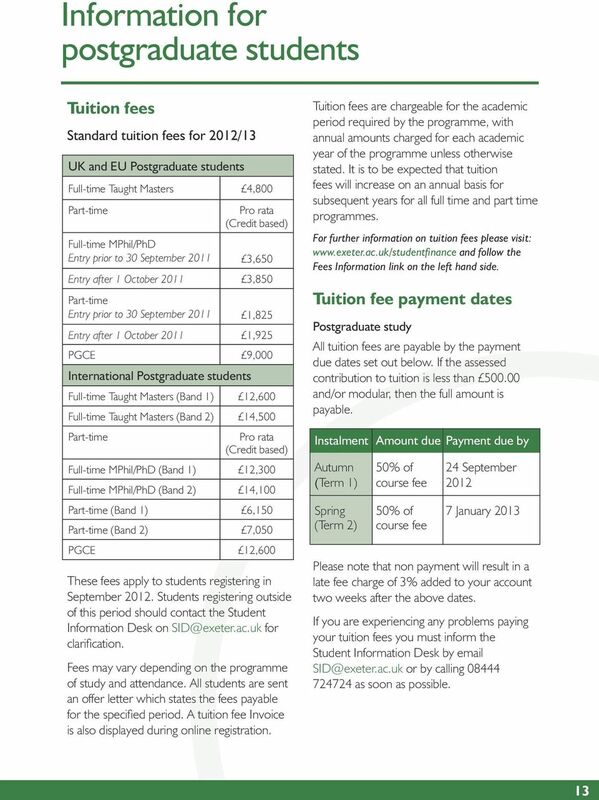 Tuition fee payment dates Postgraduate study All tuition fees are payable by the payment due dates set out below. If the assessed contribution to tuition is less than and/or modular, then the full amount is payable. Instalment Amount due Payment due by Autumn 50% of 24 September (Term 1) course fee 2012 Spring 50% of 7 January 2013 (Term 2) course fee Please note that non payment will result in a late fee charge of 3% added to your account two weeks after the above dates. If you are experiencing any problems paying your tuition fees you must inform the Student Information Desk by or by calling as soon as possible. 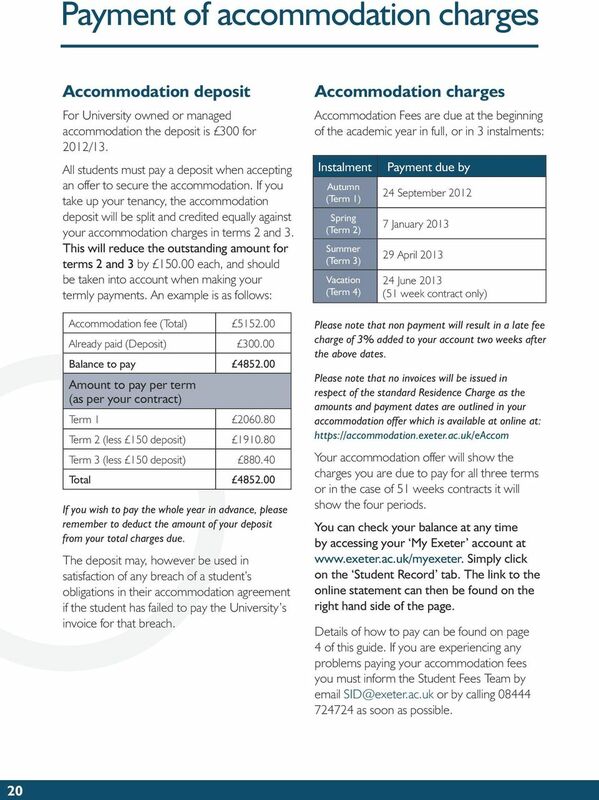 20 20 Payment of accommodation charges Accommodation deposit For University owned or managed accommodation the deposit is 300 for 2012/13. All students must pay a deposit when accepting an offer to secure the accommodation. If you take up your tenancy, the accommodation deposit will be split and credited equally against your accommodation charges in terms 2 and 3. This will reduce the outstanding amount for terms 2 and 3 by each, and should be taken into account when making your termly payments. An example is as follows: Accommodation fee (Total) Already paid (Deposit) Balance to pay Amount to pay per term (as per your contract) Term Term 2 (less 150 deposit) Term 3 (less 150 deposit) Total If you wish to pay the whole year in advance, please remember to deduct the amount of your deposit from your total charges due. The deposit may, however be used in satisfaction of any breach of a student s obligations in their accommodation agreement if the student has failed to pay the University s invoice for that breach. Accommodation charges Accommodation Fees are due at the beginning of the academic year in full, or in 3 instalments: Instalment Autumn (Term 1) Spring (Term 2) Summer (Term 3) Vacation (Term 4) Payment due by 24 September January April June 2013 (51 week contract only) Please note that non payment will result in a late fee charge of 3% added to your account two weeks after the above dates. Please note that no invoices will be issued in respect of the standard Residence Charge as the amounts and payment dates are outlined in your accommodation offer which is available at online at: Your accommodation offer will show the charges you are due to pay for all three terms or in the case of 51 weeks contracts it will show the four periods. 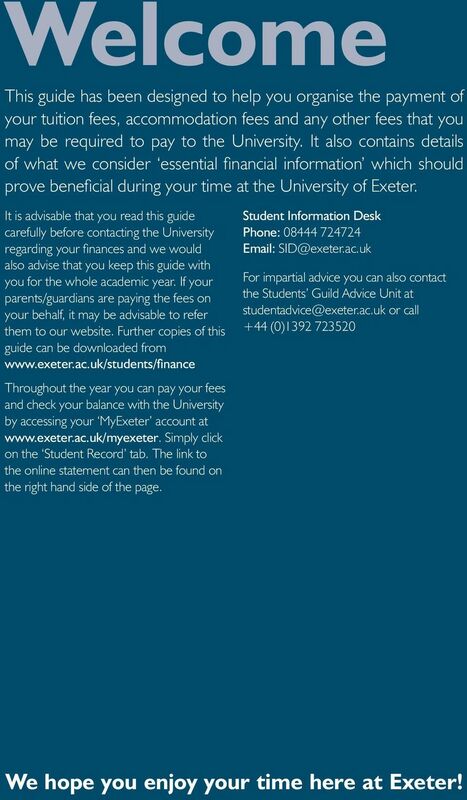 You can check your balance at any time by accessing your My Exeter account at Simply click on the Student Record tab. The link to the online statement can then be found on the right hand side of the page. Details of how to pay can be found on page 4 of this guide. If you are experiencing any problems paying your accommodation fees you must inform the Student Fees Team by or by calling as soon as possible. 21 21 Further information Payment of all other charges Any further charges or fines which may be incurred during your studies are payable within 14 days of the date of the invoice. Penalties for non-payment Students whose accounts are not fully paid by the due dates will be subject to the debt management procedures detailed below: STAGE 1 Late fee charges of 3% will be added to your account. This charge will be applied on any outstanding balance immediately after each payment deadline. By concession, the payment deadline is 10 working days after all due dates detailed within the guide. A late fee of 3% of the total debt overdue will be added each term if payment is not received by the provided deadline dates. Late fee charges plus the outstanding balance are due for payment immediately after notification. STAGE 2 Sanctions (removal of IT and Library facilities) may be applied to any account with an overdue balance. Students in debt and debt management procedures Students are required to meet all due dates for payment whether these are annual payments or instalments. Persistent failure to pay fees, charges and penalties by the due dates will be regarded as a major disciplinary offence and disciplinary action may result. Students in debt to the University may have University bursaries, maintenance and scholarships withheld (or such funds may be set by the University against the outstanding debt). No student is eligible for the award of a degree or other qualification by the University unless all fees for tuition, maintenance and any other sums, including fines owing to the University, have been paid. The University will also refuse student debtors access to degree ceremonies. We must also advise that any student in debt will not be permitted to register for a subsequent academic session. Further details regarding fees, payment deadlines and debt recovery procedures can be found on our website at part2/finance/ STAGE 3 The third stage following non-payment of fees and charges is temporary suspension from the course/programme. Any student that is temporarily suspended will not be permitted to attend lectures/classes or be in receipt of supervision or tutoring from academic staff. The appropriate College manager will be informed of this action. 22 22 START OF TERM 2 weeks to pay fees (Weeks 1-2) Debt sent to external debt collection agency (Week 12) (Week 3) Late fees applied at 3% if payment due is not received in full (Week 8) Temporary Suspension (Week 5) Sanctions applied (loss of library/it facilities) Student payment and penalties timeline The diagram above demonstrates a timeline for you to follow. It highlights the various stages of our debt management process throughout each term. It also highlights the penalties that will be applied to a student s account and the action taken by the University to recover the monies owed. 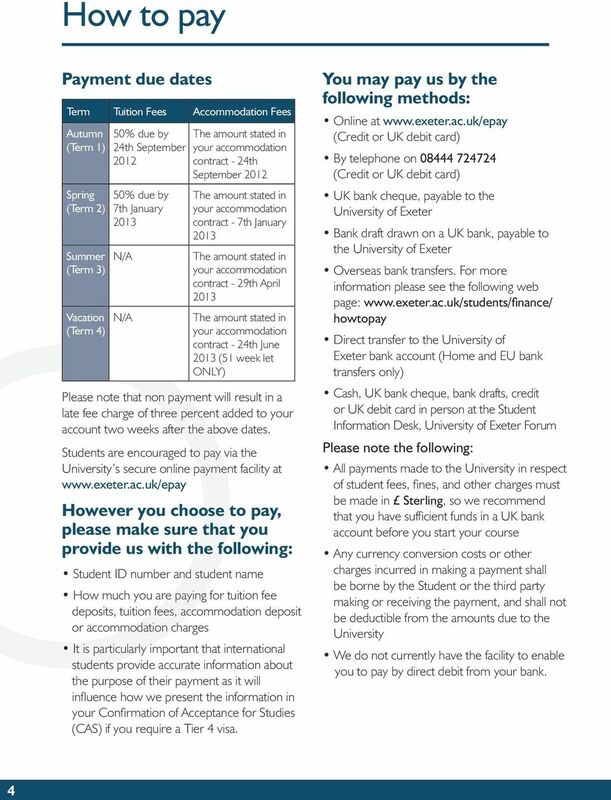 All students are reminded that they should check their University account on a regular basis as all important communication from the University finance department will be sent via this method. We will attempt to contact all students to remind them of upcoming payments due; however it is the responsibility of the student to adhere to the payment deadlines provided. Please note that the above timeline shows the activity for the autumn and spring terms only which are 11 and 12 weeks in duration. The timeline for the summer term which is only 7 weeks in duration will differ slightly. Please contact the student information desk or by calling for more details. Please note that all debts to the University are pursued. 23 Re-registering for academic years We must also advise that any student with an outstanding balance will not be permitted to register for a subsequent academic session. Students whose accounts are not fully paid by the due dates will be subject to debt recovery procedures which can result in referral to tracing and/or commercial debt recovery agents or the Courts for recovery. All additional administrative costs, including agents and Court fees, will be added to the account. Tracing agents and commercial debt recovery agents fees are not set by the University and are subject to change. They may be linked to the location of the debtor, and/or the steps taken in order to recover the debt, such as the involvement of local agents in overseas territories. Once a debt is referred to tracing agents or commercial debt recovery agents, all communications and negotiations should be with the tracing or debt recovery agent and not the University. Your contact details Please make sure that you keep your contact details up to date via your MyExeter account. We will use these details should we need to contact you regarding your student account. This may include reminders to pay your fees or information regarding funding and bursaries. Data protection authority From time to time we may need to release and discuss financial information from your student account with authorised individuals to facilitate payments and manage your student account. Under the Data Protection Act 1998, the University will not release any information without your prior written consent. We therefore ask that should you wish for us to share any information in relation to your student account to a parent or third party, please update your details through your MyExeter account or contact the Student Fees Team by at or by calling Checklist Have you arranged payment of your tuition and/or accommodation fees? If you wish to be considered for a bursary or NSP fee waiver, have you given consent to share on your student finance application? 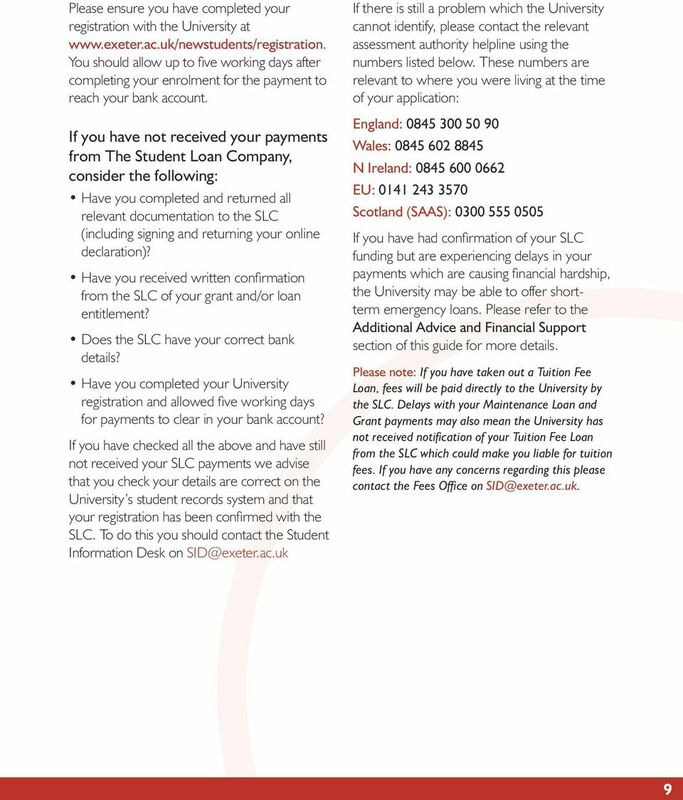 If you are due to receive a tuition fee loan, have you posted your online declaration to the SLC? Do you want a parent or third party to be able to discuss your account with us? If so fill in and send us a data protection release authority form. These are available from the Student Information Desk. Have you uploaded your bank details to MyExeter? If you are a sponsored student, have you handed in your financial guarantee? Have you logged on to your statement of account on MyExeter to check your fees due? There is also funding for students in special circumstances, e.g. those students with children or who experience a disability. What will my degree really cost?